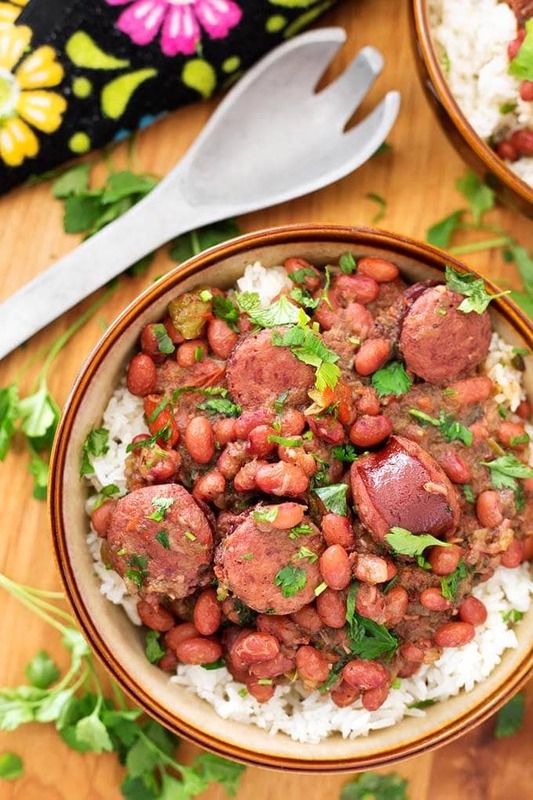 It doesn’t have to be laundry day to enjoy flavorful Instant Pot Red Beans and Rice with Sausage. 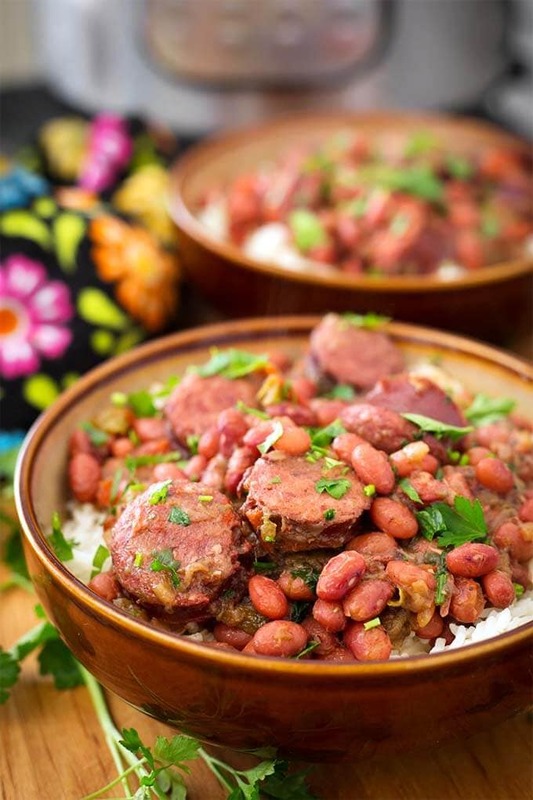 This pressure cooker red beans and rice recipe is such a delicious meal! Serve it for a casual gathering, or for a delicious family dinner. Back in the day, before washing machines, laundry day was Monday in New Orleans. The women would put on a pot of beans with Sunday’s leftover ham and bone in it to cook all day while they did the laundry. Red Beans and Rice on Monday remains a tradition to this day. While in New Orleans, I had the pleasure of eating the real deal. It was spicy, and the beans were creamy and flavored perfectly. I knew I had to have this meal again when I got home. So I set out to make my own version. 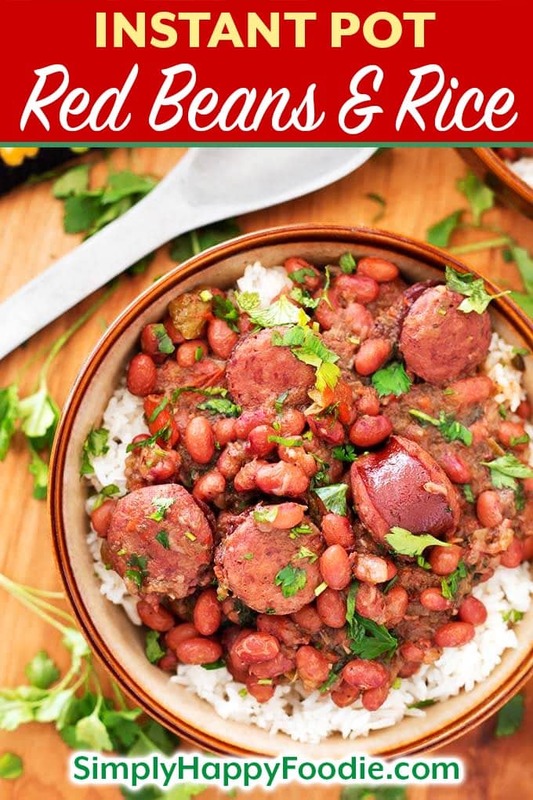 Instant Pot Red Beans and Rice with Sausage is my version of this classic NOLA meal. I wanted to make it easy to prepare, with ingredients you can find in the grocery store. You can order the Camellia brand red beans online, but the small red beans at the local grocery store gave me very good results. They are usually next to the red kidney beans, so make sure to get the right ones. For the sausage, you will have a spicy flavor explosion if you use Andouille, which is traditional. But I have used a good, smoky kielbasa and it tastes great, too. Just add more of the Cajun/Creole seasoning if you like it spicier. Or even some red pepper flakes. Don’t for get the Hot Sauce! I like to add a few squirts of my Instant Pot Hot Sauce for an added kick. You can make homemade hot sauce so easily in your Instant Pot! 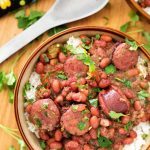 Instant Pot Red Beans and Rice With Sausage is a flavor packed, spicy New Orleans traditional meal. 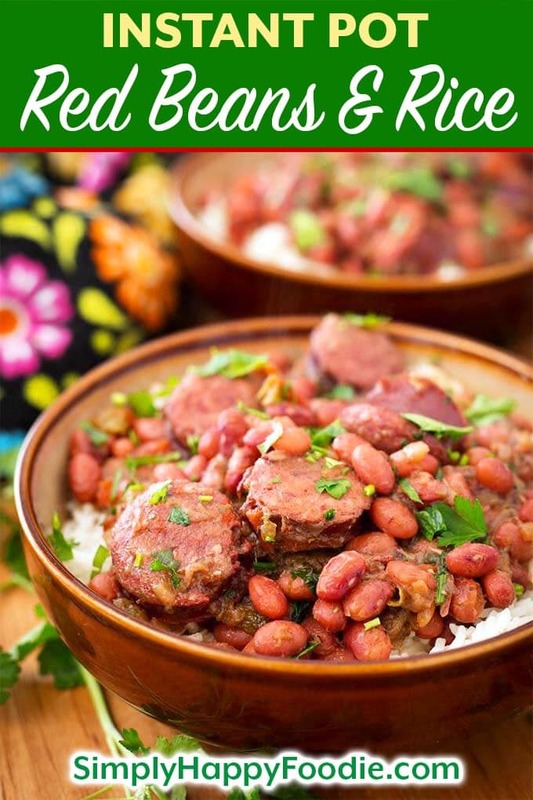 This pressure cooker Red Beans and Rice dish has lots of flavor, and you can make it from dry beans in about an hour and a half! 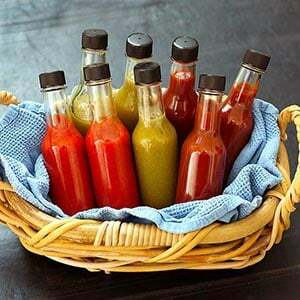 Hot Sauce, as much as you like! Turn the pressure cooker on to the Sauté setting. Add the bacon and cook, stirring occasionally, until it renders the fat. Remove the bacon and set aside (You won't be adding it in, you just want the fat). If using bacon fat, let it heat up and then proceed. If you are using Andouille sausage, add it and brown on both sides. Then remove. If using kielbasa, don't brown it, add it with the beans. Add the onions and celery. Cook for a couple of minutes, scraping the bottom of the pot to get the brown bits up (deglaze). You may need to add just a splash of the broth to help loosen it. Add the garlic, bay leaves, green and red bell peppers, sage, and basil. Cook, stirring frequently, until onion is translucent. Add the Cajun/Creole seasoning, and stir. Add the broth, beans, and sausage. Stir and put the lid on the pot and lock it in place. Set the steam release knob to the Sealing position. Cancel the Sauté function and press the Beans button, or Pressure Cook/Manual, then press the + or - to choose 40 minutes (High Pressure). When the cooking cycle has finished, let the pot sit undisturbed for 20 minutes (20 minute natural release). Then manually release the remaining pressure by turning the steam release knob to Venting. When the pin in the lid drops down, you can open the lid. Carefully stir the beans with a long handled spoon (be aware of any possible steam pockets as they "burp" and can cause burns). Taste a few of the beans to make sure they are tender. If not, close the lid and cook for 5 more minutes. Mash some of the beans and stir to make a more creamy consistency. Taste and add more seasoning if desired. Stir in the chopped parsley. Serve over cooked white rice and garnish with green onions and hot sauce. I have just brought home a instant pot. Now what do I do? Do I need to soak my beans with this recipe? Hi Selena, just sort and rinse them. Old beans will take longer to cook, but try my suggested time first. Hope you like it! I made this tonight. Had to cook an extra 15 minutes for the beans to cook but it turned out great. I added extra creole seasoning to my bowl as I wanted more spice! Hi Angie, I’m glad you liked this recipe! Sometimes beans need to cook longer. The age and type of bean will determine the cook time, as well as if you soak them first (I don’t with this recipe). The great thing about Creole seasoning is that you can use it after cooking, like salt & pepper! My hubby doesn’t like a lot of spice, but I’m with you on that! Thanks for your review! I made this tonight. It’s only the second recipe I’ve made in my new Instant Pot and it is so, SO good. Two picky teenagers agree (despite their dubious expressions earlier tonight when I announced what I’d be making). I used Aidell’s andouille sausage and orange and red bell peppers since I didn’t have a green one. Thanks for the recipe! It will be frequently used and well loved! Hi Ashley! I made this again last night! CRAVING it, lol! I’m so happy that your teenagers liked this, too! I really appreciate your review, thank you! Wow! I was not expecting this to taste so good! I made this for a work party, and brought rice to cook there in my IP. It was the hit of the pot luck! My coworkers we’re asking me for the recipe, and I think I sold a few IPs, hahaha! Thanks for a wonderful recipe! That’s great, Jillian! How fun that you brought this to work! I know what you mean about selling the IPs, maybe we should get a commission! A fan of this recipe. I’m happy to know that, Emily! The dry small red beans work the best (such as Camellia brand). Ive cooked blacked and pinto beans on default setting for 12-15 minutes. Why 40 minutes for this recipe? Hi Holli. I tested different times for for cooking the unsoaked small red beans. This is the time I needed to get the preferred creaminess. So far I haven’t been able to get soft beans in the amount of time you stated (from unsoaked beans). Maybe my pot doesn’t run as hot as yours? If you make this recipe, maybe start with a shorter time and see how it goes. You can always add time if needed. I soaked mine overnight. Would that make the difference? Yes. Soaking beans for 8 hours or more greatly reduces the cook time. Old beans will take longer, no matter what. It’s hard to tell if they are old though. One of the things I love about the Instant Pot is that you can cook a meal from dry beans quicker than the stove top. There are some bean recipes that I prefer the beans soaked first, and I have noted that in those recipes. In my opinion, beans are not a consistent food to cook! But I still love them! I’d like to use canned beans instead since I am very time-restrained. How would you recommend adjusting the recipe cook times? Hi Christopher! Reduce the liquid to about 2 1/2 cups. Reduce the cook time to 10 minutes. Also, the flavors will be a little more concentrated with less liquid, but it should be delicious!. Hi Tricia! I accidentally did that once! HOT! I’m glad you liked the recipe, and thank you for your review! If you are using the small red beans, try 18 minutes, with a 10 minute natural release. I have never soaked that particular type of bean, so this is a guess! Could you use kidney beans instead of the red beans? If so, how much longer would you need to cook them? I made this tonight for a work potluck happening in a few days (I always find that beans taste even better after a few days in the fridge). I don’t have easy access to small red beans, so I ended up using something labelled as red chili beans. They look pretty similar to the descriptions for small red beans, smaller than kidney, round and red, so I figured they’d be fine. I always seem to prefer any recipe I’ve made with dry beans, to do a slight soaking of them first, but this is the first time I’ve used these beans, and I don’t really think I needed to, as the skins are much thinner, and end up being so nice and soft, though mine were tending towards almost refried bean status due to the 1 hour soak I did while prepping other things. Despite the softness of the beans (my own fault), the taste is pretty darn yummy. Though next time, I will go with a Keilbasa sausage instead of the Andouille, as I find them the ones I have access to, too soft for this kind of cooking. Can;t wait to try this after a day of the flavours melding, I’m probably going to sneak a bowl of it for supper tomorrow night. LOL. If you’re lucky enough to be able to buy Conecuh sausage use that. It’s my favorite of all time for red beans and rice and for chicken sausage gumbo. Not too hot but spicy enough I don’t need to tinker around with Creole seasoning. Some day my husband and I plan a pilgrimage to Evergreen Alabama where it’s made. It’s readily available around here but I believe you can also order it online. We loved this recipe! My husband said he even liked it more than our favorite local Cajun restaurant! My 4 teenagers all loved it and had seconds! Great recipe! This was exactly what I hoped it would be. I avoided the celery because I dont care for it and the bay leaves just because I didnt have any. I used kidney beans since they were as close as I could find to what you called for. I cooked for 45 minutes due to the different beans. They still had a bit of a bite but I was ok with that. Even with those modifications it was fantastic and I will absolutely be making it again. You sure made it work! I hope you get to try the Camellia red beans some time. They are really good. Thanks for your review! I will keep an eye out for them for sure. Worst case scenario I just keep making it with kidney beans. I already have enough trouble not overeating with the kidney bean version, so maybe I should just stick with that! Haha! I am working on a Dirty Rice recipe. The thing that I can’t decide on has been how traditional I should go. Using all organ meat, or something more palatable to the general public. What do you think? I would think more people would be likely to try it if you avoided the organs even if that is the more traditional route. I grew up in the deep south where organs, sweetbreads, intestines, etc were all eaten. I never could force myself to try that stuff. I would guess most people that might see the recipe and want to try it would expect it to be like Popeye’s Cajun rice instead of knowing what the real deal is. I at least assume it does not have organs in it. Looking forward to seeing whatever the finished product is. Thank you for your input, Donnie! I appreciate it. I will be making it soon!